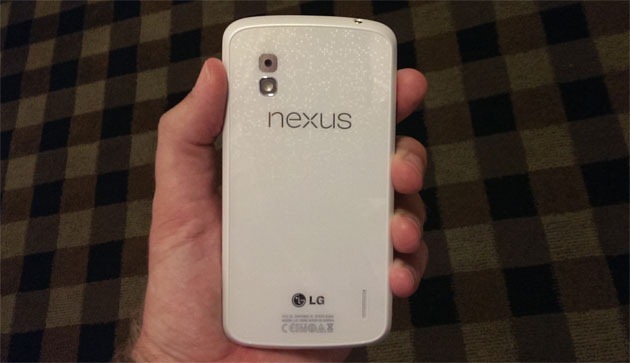 The white LG Nexus 4 has popped up a few times thus far, but now it has found its way into the hands of AndroidAndMe. The new image looks legit to us, so it appears this device is finally going to be a reality. What's potentially much more interesting is the assertion that Android 4.3 is going to be announced along with the new color option on June 10th. The white N4 reportedly has the same vibe as past white Nexus devices with a white back and black screen surround on the front. Although only the back is visible in the pic on AndroidAndMe. Specs are expected to be unchanged. There has been talk of LTE support in the white N4, but there's no mention of that in the new leak. We can't rule it out yet, though. As for the alleged Android update, sources are now saying Google intentionally bumped the announcement from the show in order to focus on proving it could push out new software and APIs without rolling a new version of the OS. A last minute change (whatever the reason) does seem likely as there are some loose ends out there still pointing to Android 4.3. The Bluetooth Low Energy support for API level 18 being the most blatant (Android 4.2 is API 17 by the way). The new software will presumably be made available on all current Nexus devices when it's released next month.